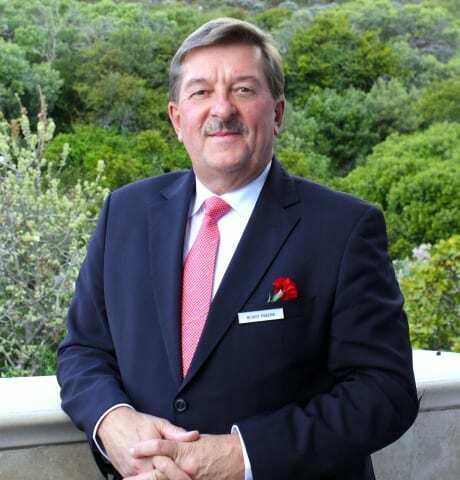 The Planner publishes this farewell message from one of the stalwarts of the hospitality sector, Horst Frehse, Twelve Apostles Hotel Executive Director, who has retired. In January 1970 I started my hotel career at the Hotel School Bad Reichenhall, Bavaria (Germany). 45 years later, it is time to say goodbye to this career and spend more time with my wife Barbara, our labrador, Simba, visit the gym and pay better attention to my health, use my bicycle more often, enjoy some hobbies and books, and of course, indulge in a bit of travel! It is with great appreciation and wonderful memories though, that I will reminisce about my career as an hotelier in the years to come. I would like to thank the many amazing guests, friends, guests-who-became-friends and many hotel colleagues who have contributed over the years to the fulfilled, exciting hotel life and career I was so privileged to enjoy. Upon celebrating my 65th birthday in mid-November, I will complete my handover at the end of November to a most competent and energetic management team at The Twelve Apostles Hotel and Spa, under the baton of General Manager, Michael Nel and Deputy GM/F&B Manager, Gavin Ferreira. Kindly continue to give them your full support, and they in turn will most certainly take great care of you, your clients, friends and family. With best wishes for a brilliant rest of 2015 and a healthy, prosperous 2016. The Planner would like to wish him all of the best on this new chapter in his life.